For materials that are directed to couples, not just to men or to women. Nilocon was launched as a low-dose oral female contraceptive pill in 1983, and was subsequently re-launched as Nilocon White in 1997. It is available in nearly all pharmacies and has been marketed as a premium brand. This is a series of demand generation 60-second radio spots for modern FP methods adapted to state-specific contexts and community structures/events. The radio spots are part of a FP campaign in Nigeria. These posters, produced as part of the family planning organization NURHI in Nigeria, serve a dual purpose. They serve as job aids for service providers and as reminder materials for clients. 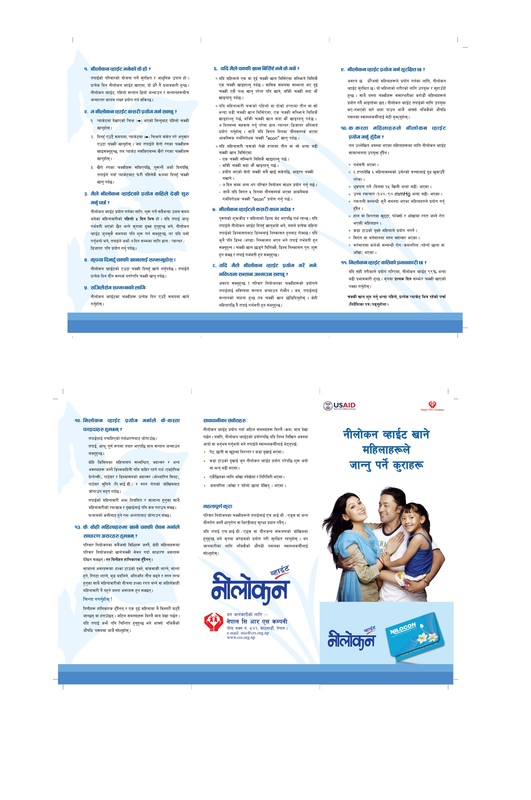 These brochures serve as a way of reinforcing information about family planning. They are distributed in Nigerian communities to remind community members of the benefits of birth spacing at all levels of society from the individual to the family and community level. This referral card from Nigeria serves as a call to action item for clients who intend to visit a health facility for FP counseling. It was printed in English and distributed in Ebonyi, Sokoto, and Bauchi communities. This is a guide for Nigerian service providers to help them in counselling FP clients on different methods of FP and Childbirth Spacing (CBS) for the adoption of a modern contraceptive method. It was didstributed in Ebonyi, Sokoto, and Bauchi states. Adapted FP-focused storylines from a TV serial drama (Newman Street). Screened during community dialogues to an average audience of about 60 persons per session. Videos are located here and here.